It’s difficult enough to think about taxes under normal circumstances. Finding yourself amid a divorce action can make this task even more daunting. A little planning, however, may ease this burden. Consider, for example, the following ideas about your tax filing status if your divorce isn’t final by December 31, 2014. Advantages of filing a separate tax return. Filing a separate return may make sense in a situation where your spouse isn’t cooperating with you. This could especially be true if your bank requires a tax return before they’ll approve a loan. Another reason for filing a separate tax return may be that you suspect that your spouse has unreported income. Filing separate returns in these situations may be a practical solution. Sometimes it makes sense to file a separate return because you’ll owe less tax. An example is where medical expenses are not deductible because your joint income is too high. With a separate return, you may be able to claim a deduction. 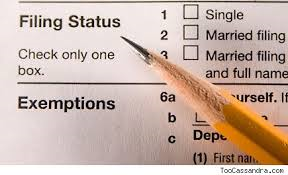 Can you change your mind about your filing status after your return has been filed? You can change from separate to joint filing status by filing an amended return. However, once a joint return has been filed, you may not change to separate filing status after the return’s due date. The bottom line: You should calculate your tax liability under both joint and separate filing choices to see which results in a lower tax. Numerous other tax and financial issues could be affected by your divorce. If you’d like tax planning assistance, give us a call. We can work with your attorney to help you make informed choices that take taxes into account.